I tried do a bunch of searches on Google for "Online Polls" and only came up with one. 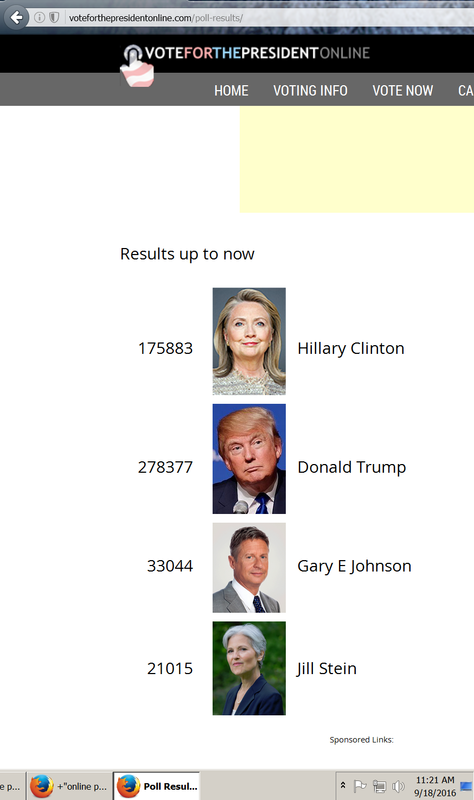 Trump was solidly in the lead on that one, by like 25%, It was some smallish town with Concord in the name, now I can't find it again. 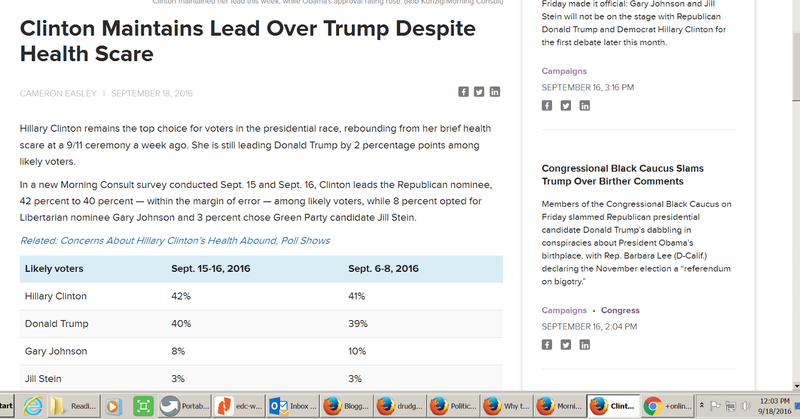 Then I tried looking for polls, using AVG search. I found quite a few and quickly--my suspicion on Google was confirmed. Google is evil, they are a tool of the global super rich. The Global super rich want Hillary in office, because she will do their bidding. This one from "realclearpolitics" shows Clinton up by about 3 in about 72% of the polls. Incredulously, this poll show a 25% Clinton lead, but its a called survey, read my notes in read. 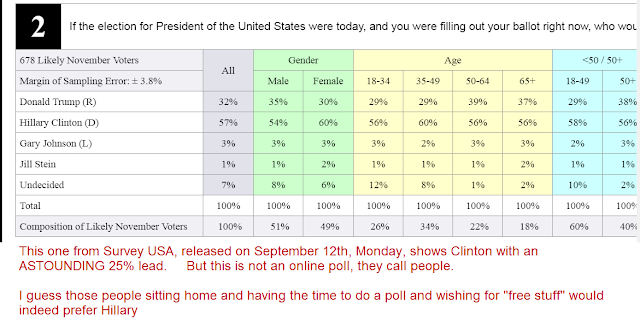 They say this was an "internet poll", but why do they present it as "Asked of 1639 likely voters". And how come such a low number? Interestingly, they also tried to explain why Trump does better in online polls, one theory (not tested by the way) was "Why? One potential reason is social desirability bias, or the tendency to believe backing Trump is not a socially acceptable position. Someone may be more likely to pick Trump when they don’t have to interact with a human — online or on a recorded IVR poll — than they would be when talking to a real live human being." LOL as opposed to "The Hillary crowd is unemployable, sitting around, plenty of time on their hands waiting for free stuff, and doesn't even have a computer to do an online vote"